Noble individuals do not announce what they plan to do. Their promise will not change even if they pass away. a Thousand Buddhas of the Fortunate Era fill the rows of alcoves. Fifteen mandalas from the great tantras adorn the ceiling. Hidden behind the main shrine is a special sanctuary, and outside in the front of the building is a wide veranda. These all represent the characteristics of a great temple hall as described in the Vinaya. The three-story hidden sanctuary enshrines a central statue of the Victorious One (the Buddha of our times), flanked by the Buddha of the past and the Buddha of the future. Here, too, rows of alcoves are filled with the Thousand Buddhas of the Fortunate Era. In front of them turquoise dragons spiral up a set of pillars, so real they seem alive. This concludes a brief explanation of what is found inside the temple building. On the exterior, starting from the highest point, a two-story curved roof in the Indian style rises in the center above the sanctuary. The upper roof is decorated with the beautiful symbols of the five buddha families: the Dharma wheel, vajra, jewel, lotus, and double vajra. Makaras (water dragons) with jewel horns extend from the four corners of the roof, which is encircled by garlands of gems and interlaced pendant jewels. The lower roof is graced with a small balcony and railing. On either side of this central roof rise two smaller roofs, ornamented with a gilded bronze finial. Below is a wide band of dark color, decorated with golden medallions depicting auspicious symbols. whose ends are painted as white circles against a dark background. Beneath is a wide band of darkcolor, decorated with golden medallions depicting the eight auspicious substances and other perfect Dharma offerings. It is like the treasury of space offering unlimited largesse. Are like the wondrous bursting forth of spring. To the east of the main temple is a five-story building containing everything needed to feed the community: a kitchen, the steward’s offices and storage rooms, dining rooms for the sangha, and a reception room for benefactors. Beyond this is a small two-story building that houses an auxiliary kitchen and offices. To the southeast of the main temple is a modern, four-story medical clinic. Nearby is the terrace for lama dancing, which has one side built into the hill and the other three supported by a single story of rooms. These are now the home of the Shree Mangal Dvip Branch School, which educates over a hundred young monks. These monks follow a progressive path of study beginning with the traditional sciences, which include the alphabet, grammar, and spelling. They then move on to read short treatises such as the Thirty-Seven Practices of a Bodhisattva. They also study ceremonies and the associated ritual tasks, such as making tormas (offering sculptures) and their butter ornaments. Mathematics and computers are also part of the curriculum as are English and Nepali. The school goes up to the ninth grade. To the south of the main temple are several handsome, multistoried buildings, which are monks’ quarters. To the west of the main temple are the eight traditional stupas, plus a stupa for Thrangu Rinpoche’s mother. 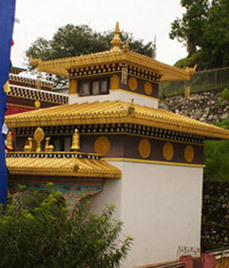 Nearby the stupas is a guesthouse administered by the main office of the monastery. Along the way back from the stupas is a stone statue of the Buddha, in front of whom kneel his first five disciples. Between them is placed a stone vase that commemorates the story of how the Buddha and his disciples miraculously came from India to Namo Buddha. Here was unearthed the vase containing the Buddha’s bones from the time he was called “Great Being,” and, on the path of learning, generously offered his body to the tigress. To the northwest of the main temple is found the attractive building of Dharmakara Publications, painted white and graced by a balcony. It contains resources for writing and translating, among which are copies of the texts and teachings of earlier scholars and meditation masters in addition to those of Khyabje Thrangu Rinpoche. The shelves also hold videos and tapes that have been published as books or are being prepared for publication. Next door is the two-story protector temple, which holds images of the lineage lamas including Marpa the translator; of the practice deities such as the glorious Chakrasamvara; of the Dharma protectors such as Mahakala; and of the deities of prosperity such as Dzambhala. Nearby is a two-story building designed as the Pure Land of Bliss (Dewachen) The base has the form of a stupa in the shape of a fine house; above it, the golden curved roof following the Indian style is decorated in the four directions with makaras dangling tiny bells that tintinnabulate in the wind. In the darker band around the top are medallions of the eight auspicious symbols and the seven royal articles. Off to the side is a stone pillar commemorating the donors and inside is a statue of Amitabha. You will perfectly connect with meditation. dialectics, Madhyamaka (the Middle Way philosophy), the Vinaya (monastic discipline), the Abhidharma (higher knowledge), and the Perfection of Wisdom Sutras, all of which are supplemented with studying other fields of knowledge. When studies are completed, Kyabje Thrangu Rinpoche gives a certificate to the graduates. Then in accord with each student’s knowledge and the extent of his dedication, he is given a position: some become teaching assistants on the way to becoming khenpos (teaching abbots), a few become teachers in the school, and others enter retreat. Every year there are two major written exams. Each month, students gather three times for discussions on various topics. Three times a year they take oral exams, and four times they practice holding a position in debate against many others. And every day they meet in the debating courtyard. In brief, except for four free days each month, ritual practices on the tenth and twenty-fifth days of the Tibetan month, and periodic ceremonies, teaching and learning the Dharma continues without interruption. 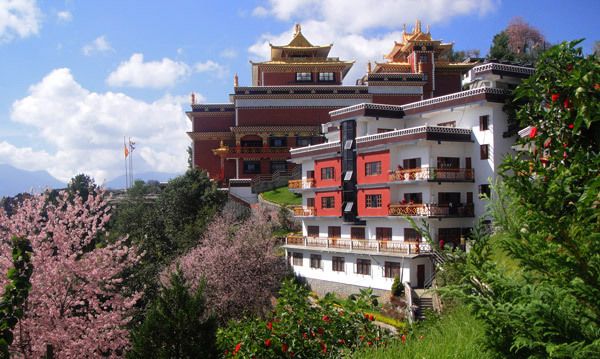 Dewachen is the pure land of Buddha Amitabha, one of the Buddhas of the five families. Buddhist believe that this is the most important and sacred of the Buddhas' pure realms and the one where it is easiest to be born. Therefore, people worship Buddha Amitabha, the lord of Dewachen, and wish to be born there. The Very Venerable Khenchen Thrangu Rinpoche built the Dewachen Temple at Namo Buddha as a representation of this pure realm. Namo Buddha is the extraordinary holy site where our supreme teacher the Buddha, having taken birth as Prince Great Courage while on the path of learning, unhesitatingly offered his body to starving tigress . Moreover, because there is a stupa here containing his bone relics, keeping pictures of the living and the deceased in the Dewachen Temple brings exceptional blessings. We place the remains of the deceased and their pictures in the Dewachen Temple and firmly pray that they may take birth in this pure realm, which is the state of ultimate bliss. 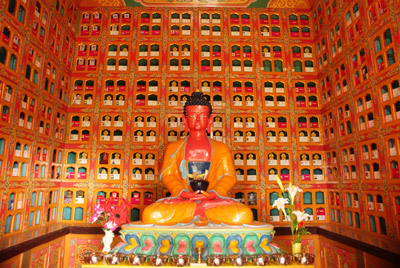 We perform Amitabha and five other well-known aspiration prayer twice a month, on the full moon and new moon, as well as on other auspicious days of the Tibetan calendar, in other to eliminate difficulties in the intermediate state and to bring about swift rebirth in the supreme pure land of Buddha Amitabha.